Wynwalloe, 10 weeks old female seal pup, was rescued on 7th January 2018 from Packet Quay in Falmouth by Tamara and Claire, members of the Animal Care Team. 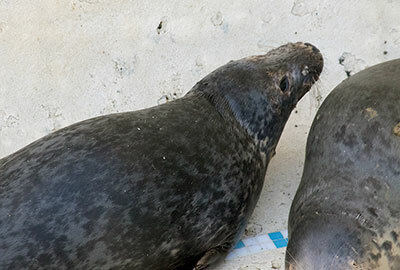 This pup was found with swollen and badly injured flippers. 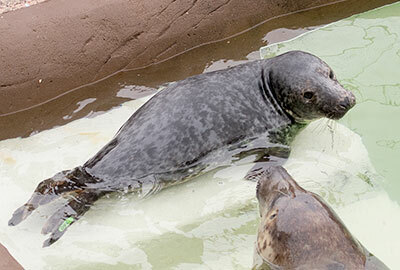 Update - 25th February 2018 : Wynwalloe is in the convalescent pool for her final stage of rehabilitation and to learn how to compete for fish during feeding time. Wynwalloe´s flipper tag number is 350 (green). The photo above and left were taken on 23rd February 2018, click here to see a larger version of these. 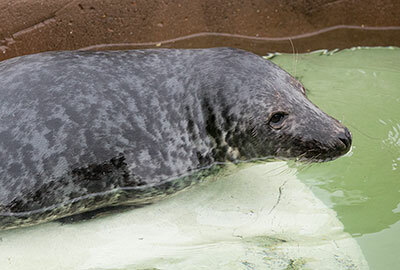 Update - 28th March 2018 : Wynwalloe is currently in the convalescent pool. She will be returned to the wild in the next month or so. This photo of Wynwalloe was taken on 26th March 2018. Update - 29th April 2018 : Wynwalloe along with Graham, Clowance, Schmirtz, Gwynnvys, Miner, Pascoe and Osborne, were released back into the wild on 20th April 2018 at Porthtowan beach. Update - 1st June 2018 : Wynwalloe was spotted at a local haul-out along the west coast of Cornwall by members of the Cornwall Seal Group Research Trust on 24th May 2018.